Michael is a comparative and interdisciplinary researcher. He has successfully published in high impact criminology journals and in edited books on policing and substance abuse. 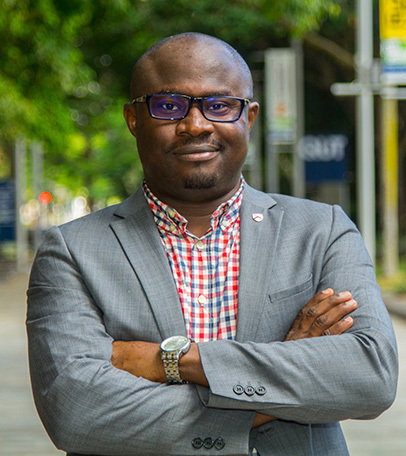 As a researcher with strong background in understanding human behaviour, he has been particularly interested in exploring how social norms, perceptions of justice and fairness, corruption, emotions and motivations, feelings of trust, and predatory policing can go a long way to influence cynicism towards the law as well as the levels of resistance and defiance among individuals or groups in the community. Taiwo K.O. & Akinlabi O.M. (2012) ‘Job type, level of education, self-esteem and emotional intelligence as predictors of attitude to work among selected Nigerian artisans in Lagos State’ International Journal of Educational Leadership. 4(4): 1-10. Aguiyi, O. A., Taiwo, K. O., Osinowo, H. O., Ottu, I. F. A., Ineme, M. E., & Akinlabi, O. M. (2010) ‘Influence of Sensation-Seeking and Impulsivity as Predictors of Drug Misuse among Youths in Ibadan’ African Journal of Drug and Alcohol Studies 9:2, 113–122. Akinlabi, O.M. (2018) ‘Why do Nigerians Cooperate with Police? Legitimacy, Procedural Justice, and other Contextual Factors in Nigeria’ in Oberwittler, D. & Roche, S (eds). Police-Citizen Relations across the World: Comparing Sources and Contexts of Trust and Legitimacy. London: Routledge. Aguiyi, O.A., Taiwo, K.O., Osinowo, H.O., Ineme, M.E., Ottu, I.F.A., & Akinlabi, O.M. (2012) ‘Assessment of co-occurring substance related disorders and mental illness among psychoactive substance users’ IN Isidore, S.O., Ibanga, A.I., & Zamani, A. (eds). Substance Abuse in Africa pp. 199-210, Uyo: Centre for Research and Information on Substance Abuse. Creativity, Innovation and Success. CYFO Behavioural Services in collaboration with the Department of Guidance and Counselling, University of Ibadan Nigeria. The Benefits and Danger in Social Media: Profiling the Causes of Cynthia Osokogu’s Death as a Case Study for Responsible Internet Friendship and Trust. Invited as a Security Expert on BCOS Television Ibadan, Oyo State (18th September, 2012).